Girls Get together in Brignano (Italy), November 8, 2014. 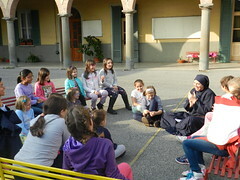 On November 8th, the Servant Sisters in Brignano had an all-day get together with girls from 6 to 11 years old. Although it had been raining non-stop for many days, the Lord gave us a splendid sunny day that allowed us to be outside. The girls arrived at 10 o'clock in the morning as the sisters were cleaning and preparing the grotto of our Lady of Lourdes. As they were arriving, they helped us out, sweeping and gathering the fallen leaves, until Our Lady’s Grotto was tidy and clean. 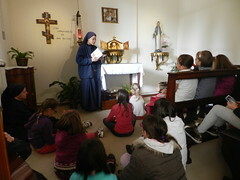 After playing a while, we went to greet Jesus in the chapel. The girls who usually come every Saturday (from 4:00p.m.-6:00p.m.) were especially happy because, when it is an all-day get-together, we open the Tabernacle and have prayer time before the Blessed Sacrament. We sang, prayed, and listened to the life of Blessed Laura Vicuña and we learned from her how to make small sacrifices out of love for Our Lady. Taking advantage of the fact that we would soon be celebrating the feast of Christ the King of the Universe, we focused our get together on that. We did as a craft, a crown for our King decorated with fish. 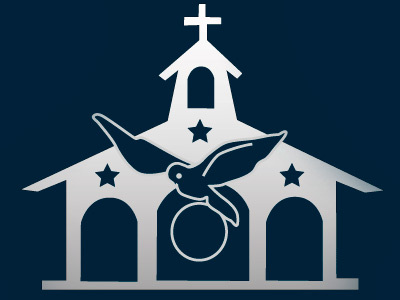 We explained to them that the fish is a symbol of the first Christians, and that the word 'fish' in Greek are the initials for: Jesus Christ, the Son of God and Savior. After having a backyard picnic, we had a meeting on the meditation of “The two flags” by St. Ignatius of Loyola. We talked about how the world is a great battlefield, with two fields: Christ’s field and the devil’s field. You need to know how each one works and how they attract people to their respective sides. Although the devil invites us to what seems more attractive, you have to choose Christ in order to reach heaven and be a part of his Kingdom. After that we had a treasure hunt with clues to find the treasures of Christ's Kingdom, and a game of 'Capture the Flag' to get the treasure hidden in the other team's field. And, on that note, the end of the day had come, an intense day and full of joy.